The 2012 London Olympics afforded the globalist promoters an opportunity to present an extensive mass ritual. The world will never be the same. What I have already reported about the wicked activities was just scratching the surface of what's developing as a result. If Zeus is another name for Satan, which is the only conclusion you can draw from Revelation 2:13, and Olympism is a religion that worships Zeus, which is beyond dispute as the very testimony maintained by the founder of modern Olympics, then it follows that engaging in Olympic activity is engaging in the worship of Satan. The son of Zeus is Apollo, who is named in Revelation 9:11 as the destroyer. Consider the evidence of this overspreading evil that has already become a one world religion, literally bringing together worshipers from all over the world. I'm one of several guests who offered some thoughts on the subject on Red Ice Radio, interviewed by Henrik Palmgren. Here's an interesting excerpt from an interview of the Opening Ceremony's director on 4/12/13. Danny Boyle: When you’re doing something like the Olympics, which is socially responsible and family oriented, the dark side of your brain doesn’t go to sleep. It’s still there, fevering away, wanting to do something dark and unacceptable. So this is what we came up with. It’s like the dark side of the Olympics. Wired: What’s the dark side of the Olympics? Danny Boyle: There are lots of dark sides, believe me, none of which you’re allowed to mention. The IOC is a corporation, like Coca-Cola, with massive vested interests and an ethic to protect its image in a way that doesn’t fit with the festival of peace it’s meant to be. Part 3 - 2012 London Olympics - Olympics, Giants and Bells - OH MY! Part 8 - 2012 London Olympics - The Bell of Caliban: Be Afeard! Part 21 - 2012 London Olympics - Neo-Solomon's Temple - Under Construction? 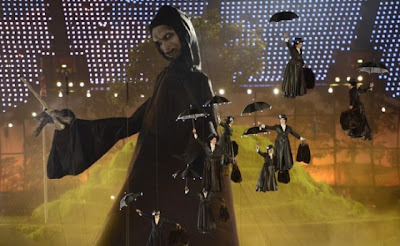 Part 32 - 2012 London Olympics - One Creepy Baby, in a Zeus Free Zone? Part 33 - 2012 London Olympics - NHS-GOSH: An Illuminati Front? wow, thanks for many information here, sir! Elishabella, thanks for the link. Part 41 - Rango - Form a Possum! Part 3 - The Sodomite Gateway - Look Out Below!